BELIZE CITY–A group of teenagers from Canaan S.D.A. 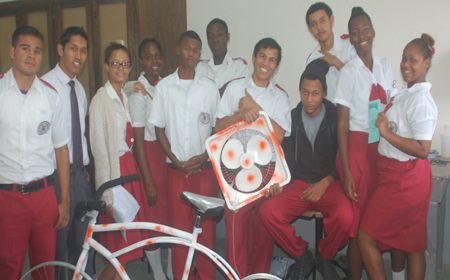 High School in Belize City have put together an innovative energy-generating contraption which is designed not only to improve ventilation in some of their classrooms, but also to propel them to success in an upcoming regional competition known as The Sagicor Visionaries Challenge 2014. Through the yearly event, students between the ages of 11 and 18 years from high schools all over the Caribbean are stimulated to solve problems of sustainability in their schools and communities through STEM, which stands for a combination of Science, Technology, Engineering and Mathematics. 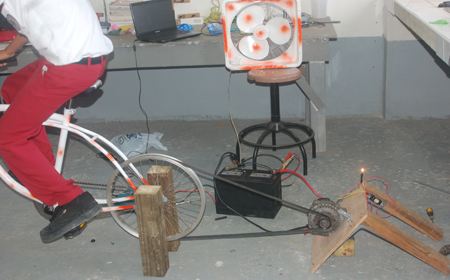 Since some of their classrooms are made of metal, which is known to conduct heat, the students have decided to create an electromagnetic generator ventilation system made up mainly of a bicycle, an alternator, an inverter and a car battery, which will be used to power wall fans inside the classrooms to reduce the heat and make the classrooms cooler. When Amandala visited the school today, the students were putting on the finishing touches on their invention and Pedro Garcia, chemistry teacher for the school’s 3th and 4th form classes, told us about it. “The project is called an electromagnetic generator ventilation system; it’s spurred by a bike which will rotate an alternator which is connected to a battery and an inverter then finally to a fan and any other ventilator that is available. At our school, some of the buildings are very hot because they are made of metal, so we decided to do this project so that the children can have a better learning environment,” he explained. Garcia said that they have since submitted a requisite 12-page report to the competition’s organizers who approved their participation in the contest, which encompasses the subjects of engineering, biology and technology. He explained that there was a lot of difficulty to initially get the project off the ground because many of the students live in the districts and have to travel every day; however, they made sacrifices to stay back at school during the evenings, and even got together on weekends to work on the project. While noting that their budget was low, he mentioned that they also mustered assistance from other students and businesses in their community in order to make the project a reality. Although this is their first time competing, and there are a total of 85 competitors who have entered the challenge, the teacher emphasized that his group has high hopes of winning based on their novel idea, and asked the public to promote their project by voting for it on the competition’s social media page. Representatives from The Sagicor Visionaries Challenge will be in the country this Wednesday, December 3, to evaluate the entries from Belize. The winners of the challenge will receive a US$5,000 grand prize in addition to a trip to The National Aeronautics and Space Administration (NASA), which is located in Washington, D.C., USA.